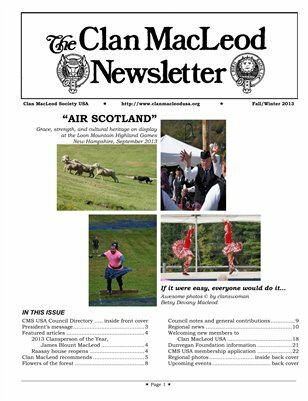 This newsletter is the semi-annual publication for members of the Clan MacLeod Society, USA. We are experimenting with MagCloud as a method of offering a premium color version of our newsletter for sale to our members, and perhaps to the wider public as well. If you have any feedback on this issue or the premium color option, please contact our Newsletter Editor (nominated), Dorna Caskie at dcaskie@greennet.net. Our website can be found at http://www.clanmacleodusa.org. Thank you for your interest in the Clan MacLeod.